This 5 meter / 16.4 feet long High Density RGB LED strip is easy to use with double the LEDs per foot! Just 4 wires, 1 for Red, 1 for Green, 1 for Blue and 1 for Power! That's it! Connect 12V to each of the wires for Red, Green and Blue to change the color of your lighting. Combine to make different colors like Red & Blue for Purple lighting! 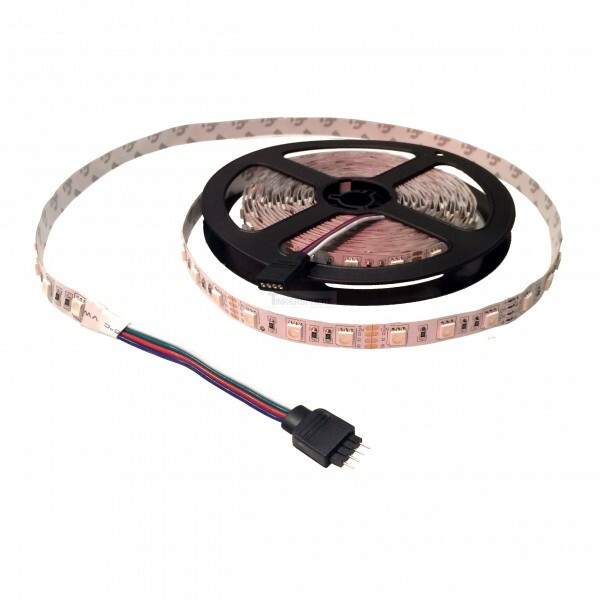 This 5 meter / 16.4 feet long High Density RGB LED strip is easy to use and has 2 times the LEDs as the standard RGB LED Strip! Just 4 wires, 1 for Red, 1 for Green, 1 for Blue and 1 for Power! That's it! Connect 12V to each of the wires for Red, Green and Blue to change the color of your lighting. Combine to make different colors like Red & Blue for Purple lighting! This strip of 150 LEDs can be lit with 16 color combinations! If you are familiar with controlling an RGB LED, think of the strip as a giant RGB LED when it comes to controls! Use a 12V 6A DC power supply to power the whole 5 meter long strip and this controller.